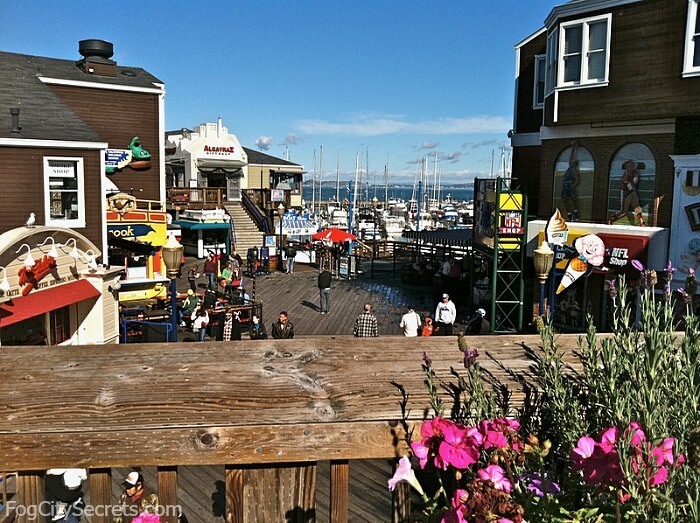 My suggestions for fun things to do at Pier 39! 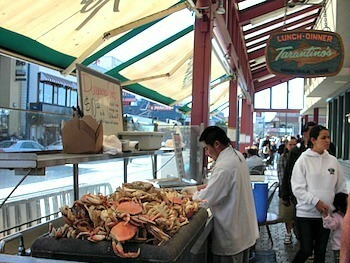 Pier 39 in San Francisco is one of our most popular tourist attractions. Is it fun? Worth a visit? Or just a tourist trap. As a long time resident of San Francisco, I can tell you that the locals shun Pier 39. It's gotten a bad rap because it was created specifically for the tourists; but is it fair? Here's what I found. 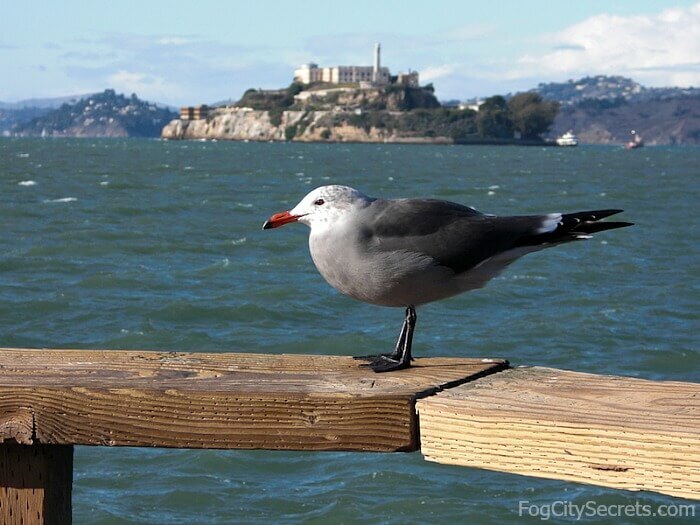 San Francisco's Pier 39 is essentially a two-story, outdoor shopping mall, with gorgeous views of Alcatraz and the Golden Gate Bridge, and its own colony of sea lions. I put on my safari gear and headed down to Pier 39 to do some research, expecting to be drained by the commercialism and tackiness, but instead...I had a great time! Yes, it's commercial, and it's not the real San Francisco, but there are lots of fun things to do and see, and some pretty cool shops as well. And the views are spectacular! Restaurants: 11:30 am to 10 pm. Attractions: 10 am to 10 pm. Fast food: 10 am to 9 pm. Stores: 10 am to 9 pm. There are exceptions: some restaurants open earlier for breakfast, and some stay open later. Check individual restaurants. There are directories posted at intervals with all of Pier 39's tenants, so you don't really need a map once you're there. The sea lions started moving to the Pier 39 Marina after the earthquake in 1989. Eventually so many moved in, the boats had to move out, and now they loll on the floating wooden docks all day. 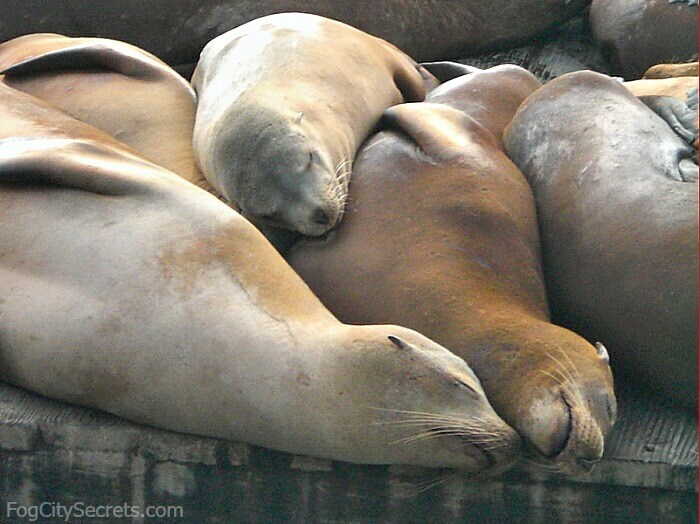 Most of the sea lions are sound asleep, but there are always several malcontents in the group that bellow and groan at each other, arguing over a favorite spot on the planks. Where are they? Go all the way to the end of Pier 39, and turn left. The sounds and smells will tell you where they are! Where did they come from? 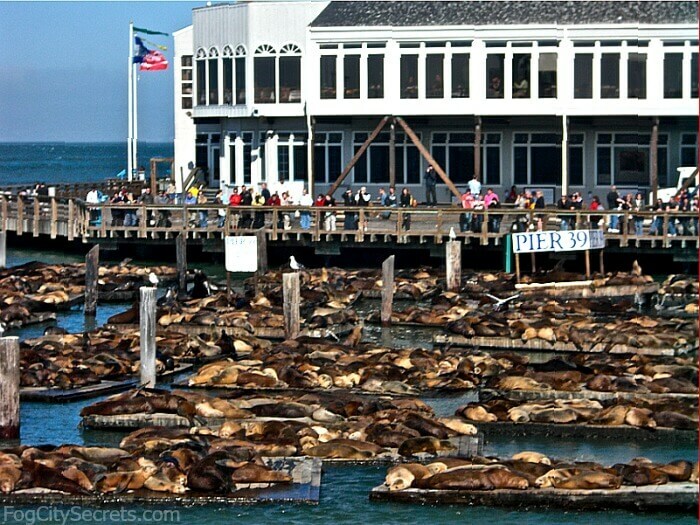 It went from no sea lions at Pier 39 to a thousand in just a few months in 1989. Apparently, they moved from Seal Rock, by the Cliff House on the western edge of the city. There used to be a sizable colony out there, but there are hardly any now. Now, the numbers of sea lions at Pier 39 typically run from 100 to 600 (when they're there). Where did they all go? Visitors coming to San Francisco in June and July are often surprised to find the sea lions missing in action, or just a few stragglers hanging out on the docks. The boys (and most of the Pier 39 sea lions are males) head down to Santa Barbara in Southern California in May or June to mate with the female sea lions, who spend most of the year down there in the Channel Islands. Their job done, the guys head back to Pier 39 around the end of July. Sea lions can stay under water for almost 10 minutes and they can stay out at sea for two weeks. Why do they hang out at Pier 39? 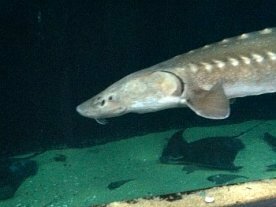 They have a good food supply in SF Bay and their predators, the orcas and Great White Sharks, don't usually come into the bay. Plus they can sleep all day on the floating platforms; on land, they have to keep moving as the tides change. The platforms they're lying on were built specially for them, after their weight destroyed the boat dock that was there! Are they dangerous to humans? Generally speaking, no, as long as they're not provoked or confronted. But during the summer of 2018, a rogue sea lion started biting swimmers at Aquatic Park, at the other end of Fisherman's Wharf, and the swimming area was closed for two weeks. But that was very unusual. Pier 39 Webcam. They have a webcam so you can check to see if they're home, and what they're doing. Sea Lion Center. On the second floor of Pier 39, just above the sea lion docks, there's an exhibit with information on the sea lions and a staff member to answer questions. The setting of Pier 39 on the wharf in San Francisco couldn't be more entrancing. Head out to the end of the pier and there's Alcatraz straight ahead, and to the left, the Golden Gate Bridge. You can watch all the maritime activity, with sailboats and ferries coming and going, and the huge container ships lumbering into the harbor. A fascinating aquarium showcasing the sea life of San Francisco Bay. Check out who's living in the water just off the dock, and watch sharks being fed. Plus a cute sea otter area. $2.50 off if booked online. For more info, and booking, see Aquarium tickets. This really is a pier, so it's not surprising that a number of boats leave for their bay cruises from this spot. This is one of the most fun things to do at Pier 39, I think. 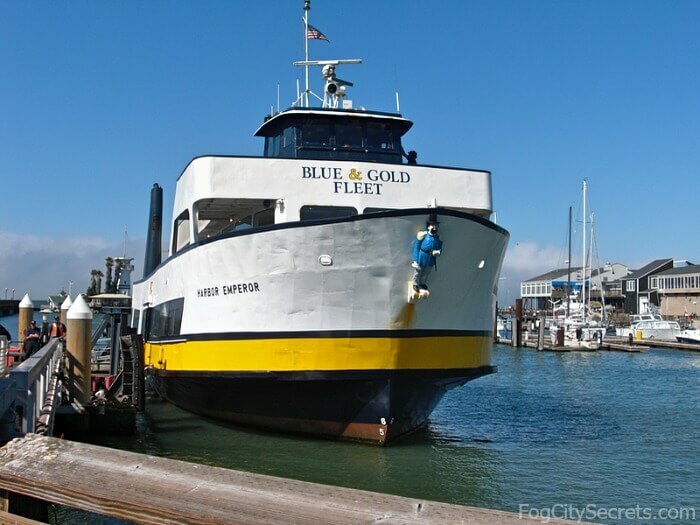 For many of these bay cruises, you can get steeply discounted tickets through Goldstar.com. It's free to sign up with them, then you can check for the tour you're interested in. Lots of other SF activities are available, also, often for roughly half-off. They have some great deals, so always check with them first before booking. See Goldstar.com. The Blue and Gold Ferry sails out under the Golden Gate Bridge, then around Alcatraz, and past the San Francisco waterfront. One hour cruise, very enjoyable. See Bay Cruise for more info and booking. The Rocket Boat is another fun ride, 30 minutes of speed and rock and roll. You can read about my experience riding the Rocket Boat, or go to Rocket Boat for booking. $3 off to book online. The Rocket Boat operates May through October. Or sail out under the Golden Gate and around Alcatraz on a catamaran. 90 minute cruise, with drinks and snacks on board. 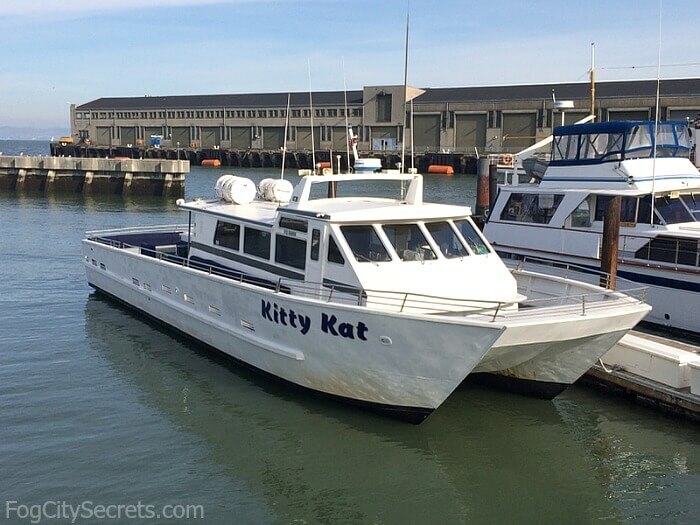 See Adventure Cat Cruise for info and booking. One of my very favorite cruises is the 90 minute trip on the classic Privateer yacht, leaving from Pier 39. Glide all around the Bay and past Alcatraz, with two free glasses of wine or beer. See Sailboat Cruise for info and booking, or read about my experience out on the water with the mellow crew, at sailing on the bay. Whale-watching cruises. San Francisco's whale-watching tours leave from Pier 39 as well. From May through October, you can take the 2.5 hour tour that sails across the bay and out through the Golden Gate to the open ocean. In addition to the migrating whales, you'll likely see dolphins and seals, and sometimes Great Whites. $45 per person. See whale-watching tours for more info and booking. Another whale-watching tour runs in winter (December-March) and goes in search of the gray whales, up the coast and around the bay. Heads up to the pretty coastal areas around Stinson Beach and Point Reyes. Probably see porpoises and seals, as well. $59. See gray whale tour for booking and info. If you've got a cast-iron stomach, there's an all-day trip out to the Farallones Islands. In addition to the whales and dolphins, you'll see the craggy nesting areas for thousands of seabirds, including puffins, and the breeding grounds for the elephant seals. This is also where the Great White Sharks hang out. $99, 6 hours; runs Saturdays & Sundays, March - November. See Farallones whale-watching tour for more info and booking. I've been on a lot of these bay cruises and they're a lot of fun! 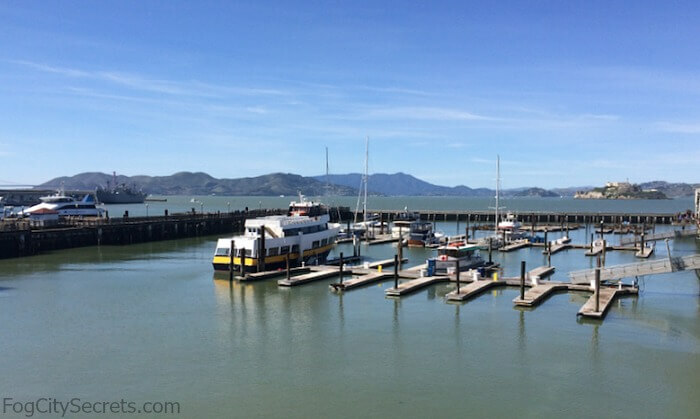 For a list and description of the many San Francisco bay cruises available, with photos, see my page on the San Francisco Bay Cruises. The Zombie Apocalypse! Have a virtual adventure with 3D glasses, moving chairs and laser guns to shoot at the bad guys. Even gusts of wind! Carnivale: creepy clowns in an abandoned amusement park. Zombie! : a zombie invasion, naturally. Gigamon: giant monsters attacking in an urban setting. Road Fighter: sort of Mad Max in a city with robot-like guys ambushing you. Forbidden Mine: racing through mine tunnels chased by skeletons and mummies. Los Banditos: robot bandits in the Old West. Werewolves: chasing you through the streets of London. Tip: they only display four rides at a time, but the others are sometimes available if you ask. Or do all seven (each "ride" is only about 5 minutes). 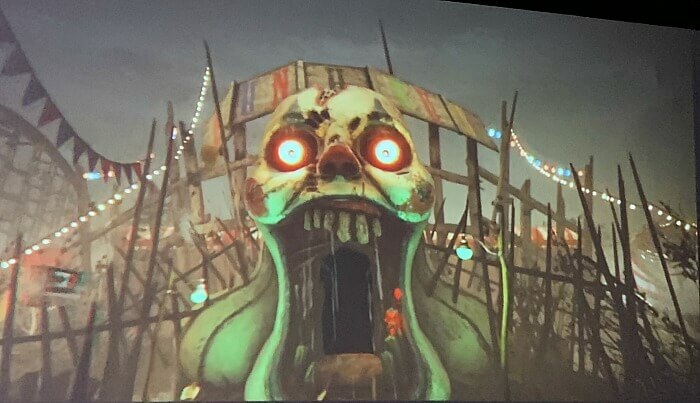 The newest ride is Carnivale, deliciously creepy. Homicidal clowns, walking doll heads, and a great roller coaster ride! Plus bumper cars with maniacs. Not for young kids, or folks with clown phobias (coulrophobia?). The zombie one is really scary. The Werewolves ride was fairly scary, too. The others are exciting, but not as frightening (better for younger kids). 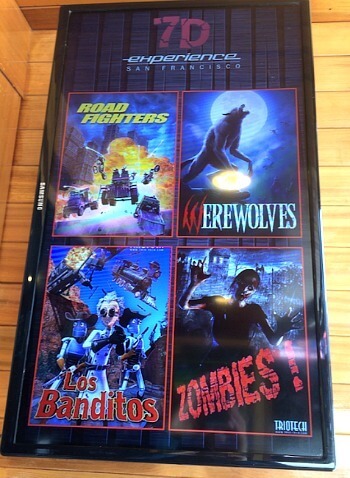 The Los Banditos ride is probably the best one for the youngest kids. Enter the Carnivale at your own risk! You can also disconnect the moving feature of the chairs if you like (for folks with back or neck problems), but they don't move around all that much. They post your score with your photo on the screen at the end, so stay alert! Kids love this and even more mature folks (like me) have a great time. A group of teenage boys coming out pronounced it "awesome!" The first ride is $11.99 ($2 less with the Fun Pack, see below), and the rest of the day's rides are $6. Ground level, at the back on the right. 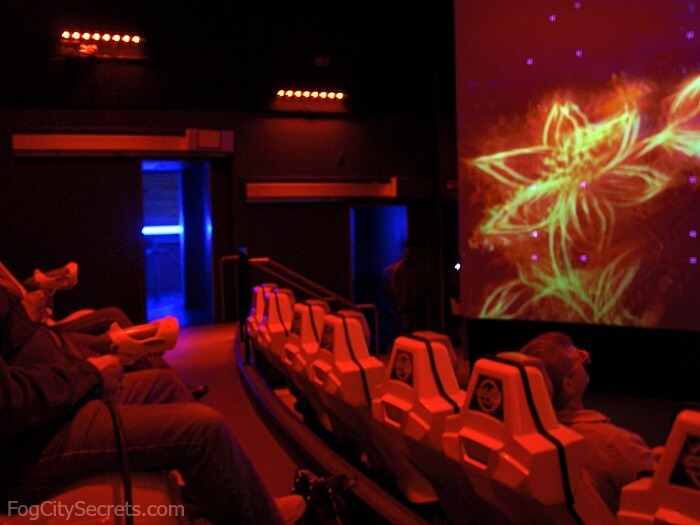 They also have a laser adventure, a dark room where you can dodge laser beams. Do both the adventure ride and the laser challenge for $12.99: get $2 off the combination if you book online, see here. I've tried all of the scenarios, and enjoyed them, with no motion sickness (unlike the Flyer, below, haha). This is one of the attractions available with City Sightseeing's Mega Pass. If you plan to do several activities at the wharf or elsewhere in the city, their pass can be handy and save some money. There are lots of things to choose from, including bus tours, museums, bay cruises, the Exploratorium, aquariums, bike tours, etc. See Mega Pass for details and booking. Something new at Pier 39! 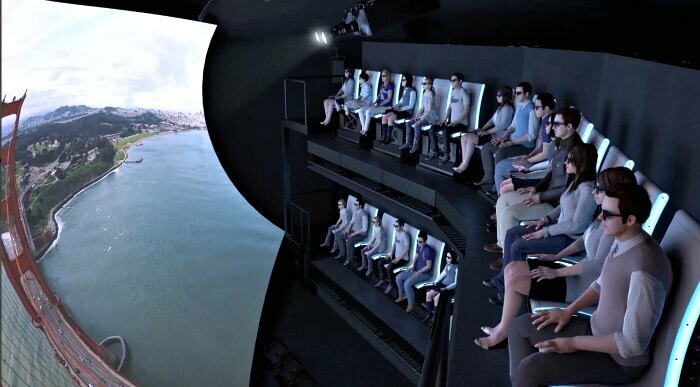 From the makers of the 7D Experience, another 3D ride with moving seats and wind in your hair. This time, you're flying over San Francisco, zooming around the bay on the Rocket Boat, riding bikes through the redwoods, and more. This is an exciting trip, flying over and through San Francisco landmarks (and inside the deck of the Golden Gate Bridge!). Next door to the Aquarium of the Bay at Pier 39. Adults, $25, Kids, $15. See The Flyer for more info and booking. 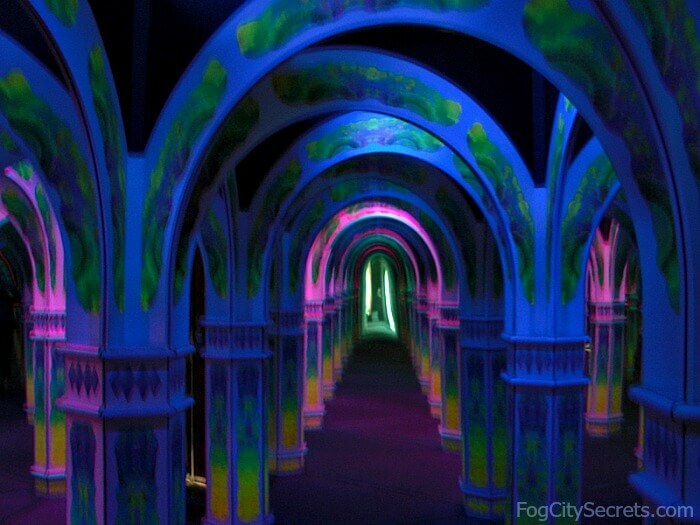 Dare to enter the Magowan's Infinite Mirror Maze! Appropriately for San Francisco, this is a very cool, almost psychedelic, experience: lights flashing to the music, beautiful, shifting colors, and endless vistas that are not what they seem. Takes about 20 minutes to get out. Lots of fun. Still only $5 ($1 less, with Fun Pack). Second level, on the right. Also, Groupon sometimes has 50% off tickets: see groupon.com. This pretty, two-story carousel was made in Italy and decorated with scenes of San Francisco. 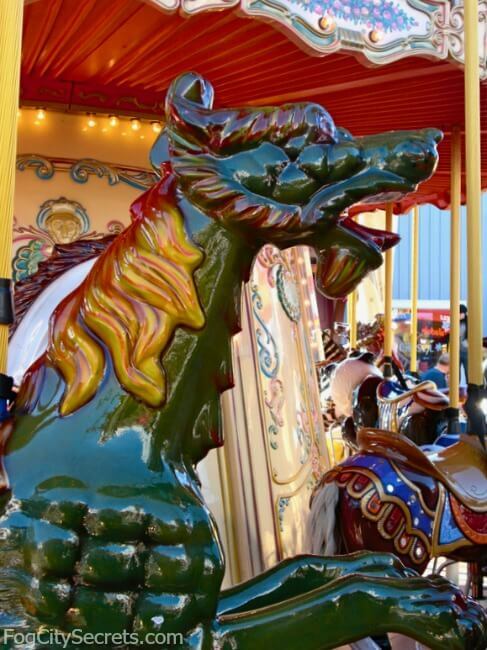 Ride some beautifully painted, and rather odd, creatures like sea lions, water dragons and mer-horses. The stage behind the carousel hosts almost non-stop, free entertainment in the form of magic shows, jugglers, comedians, etc. The Musical Stairs. One stairway between the two floors of the pier has been converted to a giant piano keyboard, created by the same the artist who designed the floor piano in the movie Big. It really works! About halfway back, on the right side. The Frequent Flyer. Bounce on a trampoline while suspended by bungee cords. Do forward and backward flips. Looks like fun! On the right side, not too far in. 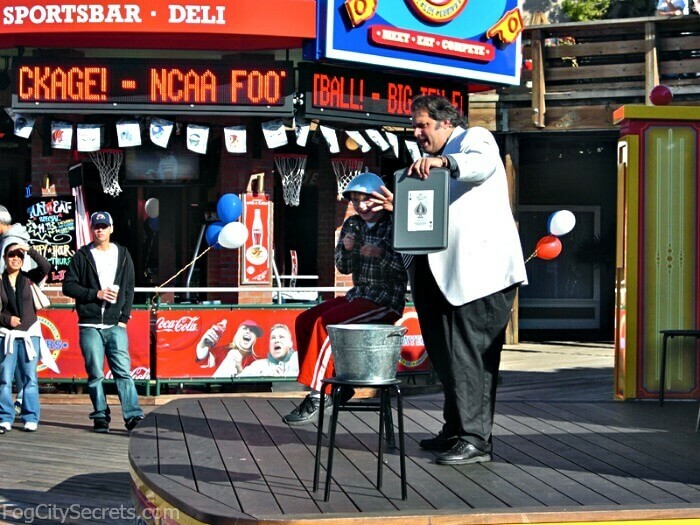 There are a number of events that Pier 39 does every year. Sea Lions Welcome. Annual celebration of their arrival. January. Tulipmania. Beautiful tulips all over the pier. February. Spring Wine Pour. Wine tasting and entertainment. May 17, 2019. 4th of July. Entertainment and great view of the fireworks. Fleet Week. Military bands & watch the Blue Angels. October 6-14, 2019. More on Fleet Week. Christmas Tree Lighting. Music & hot chocolate. See Christmas in SF for more things to do. 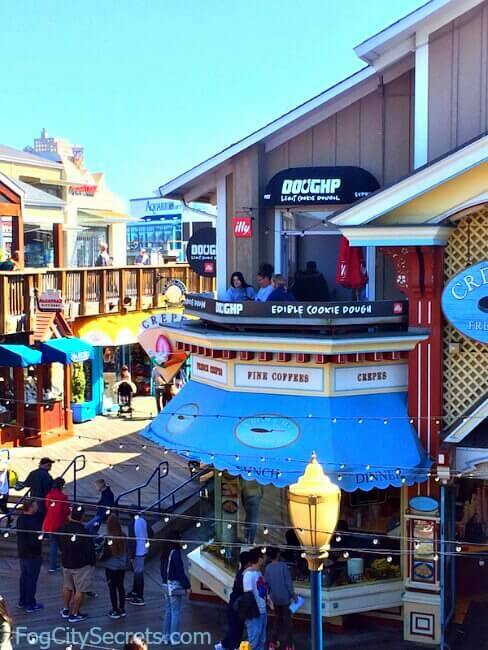 Shopping is a big part of the attraction of Pier 39. If you're looking for souvenirs, you're in the right place. San Francisco sweatshirts, mugs, posters, cable cars, and more. There are tons of shops, too many to name, but covering just about everything you could imagine, including left-handers' goods, doggie boutiques, handbags, jewelry, magic tricks, scarves, pearls, charms, candy, fairies, crystals, bamboo textiles, ceramics, etc. The clerk in the Magic Shop was performing some amazing sleight-of-hand tricks for customers when I was there. One thing is true: no one will go hungry at Pier 39! There are 14 sit-down restaurants here, plus many other places to pick up goodies at the pier: candy, pretzels, crepes, chocolate, fudge, and ice cream, and more. The food here is OK, not great by San Francisco standards, but convenient and lots of variety. Some of the restaurants have great views: Fog Harbor Fish House, Hana Zen Japanese Grill, Luigi's Pizzeria and Louis's Swiss Italian and Seafood Restaurant. The Hard Rock Cafe has a restaurant here as well, at the entrance to the pier. Choose from seafood, pizza, clam chowder, Mexican, Italian, Japanese, hot dogs, and burgers. The Fog Harbor Fish House specializes in seafood, as you would guess, and has a great view of the west side of Pier 39. You can see the Blue and Gold Ferry coming and going, and the Rocket Boat as well. 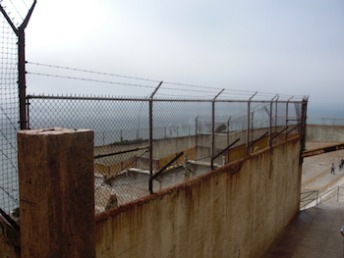 The sea lions are on this side, too, and Alcatraz is visible in the distance. Nice spot for lunch. They've been winning Best Scenic View from Open Table diners every year. Pier 39 Sports Bar. The Players Sports Grill & Arcade is the ultimate sports bar, with over 200 sports channels available on 30 screens. International games as well as US. Plus a Tiki Bar and a good view of the bay. Note to parents: they also have an enormous collection of arcade games. Over 85 games, including pinball, air hockey, Ms. Pac Man, and a Western Shooting Gallery. It doesn't look big from the entrance, but there is room after room of games! If you have as much trouble getting your kids out of these arcades as I did when my son was younger, you've been warned! You may want to steer clear of this sports bar;) On the other hand, you can also relax awhile while your kids are being entertained. It's on the ground floor on the right side, next to the carousel. Chocolate lovers? There's a shop called Chocolate Heaven worth a visit. 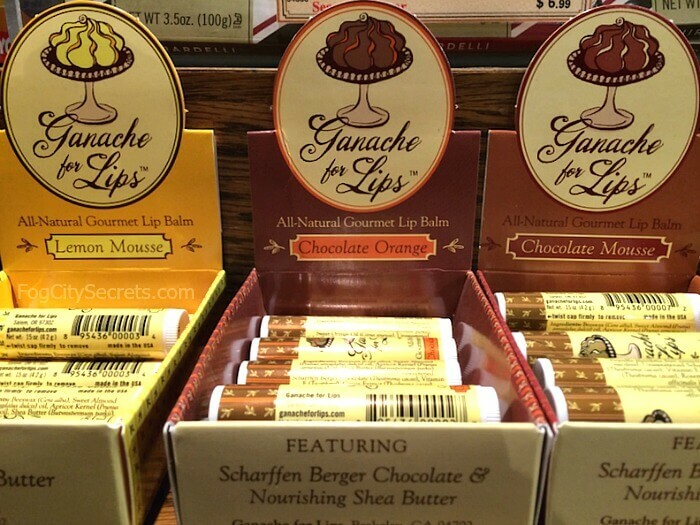 Check out the chocolate lip balm; I can recommend the Chocolate Mousse. And more chocolate: another shop here specializes in fudge. Edible cookie dough has arrived at Pier 39! DOUGHP (pronounced "dope") sells cookie dough by the scoop, like an ice cream parlor. This is their only outlet, though they do sell it online as well. No eggs or raw flour to worry about. Choose yummy sprinkles for them in a cup, or get them in an ice cream cone. Leftovers? Take them home and bake cookies. Very tasty! Wine tasting. If you can't make it up to the Wine Country during your visit, no problem. Pier 39 has a nice wine bar where you can taste many of the California wines, or just sit with a glass of wine and enjoy the view. The Wines of California Wine Bar is on the ground floor, on the right. They also have a pleasant, outdoor seating area. A nice place to escape the crowds and relax by the water. Beer tasting. The SF Bay Area has a lot of craft breweries, and you can try out some of our beers at Pier 39. Beer39 is on the second floor, on the left side of the pier. They have 39 (of course) different beers available and they've created 4 tasting flights of 3 beers each to do tastings. See Bier39 for the tasting options. For more local beer exploration, our own Anchor Steam Brewery does a really fun tour, with generous tastings. See my page on the Anchor Steam Brewery for more info. Free Wifi is available at the Pier Market Seafood Restaurant, Fog Harbor Fish House and the Wipeout Bar and Grill. Charge your mobile phone while you eat. Ask for a charger at the Pier Market Seafood Restaurant, Fog Harbor Fish House or the Wipeout Grill. Security. The Pier 39 management runs a tight ship and doesn't tolerate panhandling or other unpleasant behavior of the kind all too common in SF these days. They have 24 hour security, and do a good job maintaining a family-friendly environment. 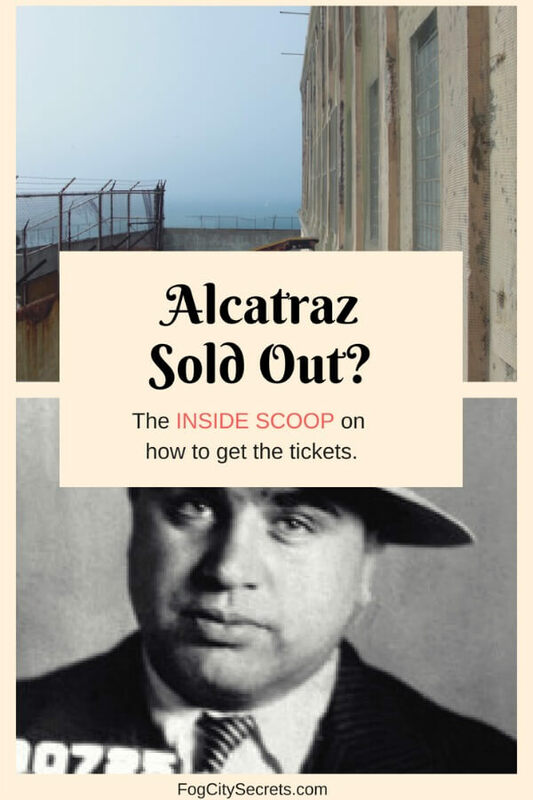 You can get passes that include some of the more expensive attractions, like the Aquarium, Exploratorium, bay cruises, or city tours. One option is to get a City Sightseeing Mega Pass, which gives you a choice of several attractions (3, 4 or 5) from a laundry list of 25 things to do in SF. 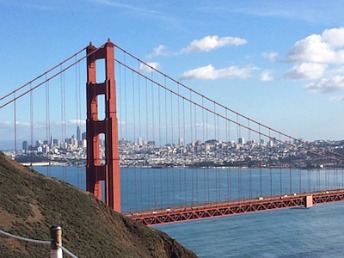 A good deal if you plan to do a number of activities in San Francisco. 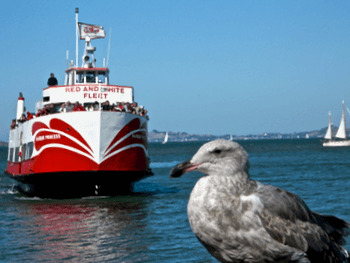 The list includes a number of Pier 39 and Fisherman's Wharf attractions, like the Bay Cruise, Aquarium of the Bay, Rocket Boat, 7D Experience, San Francisco Dungeon, bike rentals, Go Cars, Escape from the Rock Cruise and the Sausalito Ferry. The Mega Pass also includes lots of other attractions around San Francisco, like the Exploratorium, major museums, city tours and the SF Zoo. For more info and booking, see SF Mega Pass. 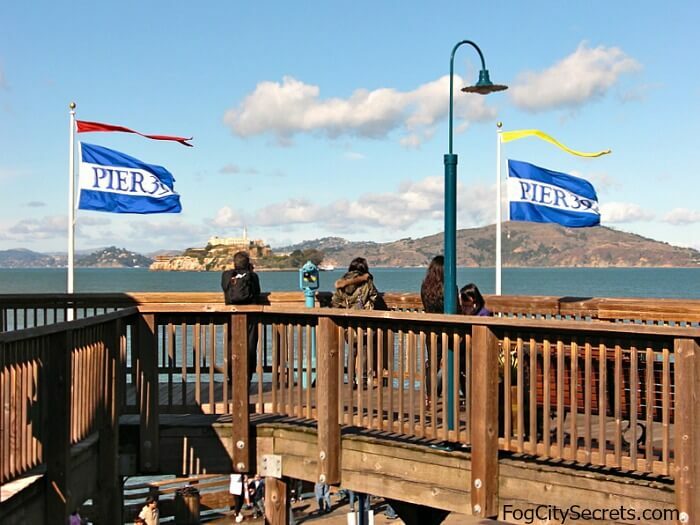 Pier 39 is one of the stops on the Hop On, Hop Off Bus City Tours, the double-decker buses that take you all over the city, while a guide fills you in on the sights you're passing. This is a great way to get an overview of San Francisco's most interesting attractions, plus easy transportation around the city. You can get 1 or 2-day bus passes. The 2-day and premium 1-day passes include the City Tour and Sausalito Tour, plus a walking tour and some other goodies. See Hop On Hop Off Bus for info and booking. $5-$8 off if booked online. Go up to the California Visitors Center on the second floor, left side, and get a Fun Pack. It's a free, 55-page booklet of coupons, just for Pier 39 stuff (including 1 hour free parking at the garage across the street). Good deals...free desserts, free appetizers, discounts on attractions and shopping, etc. 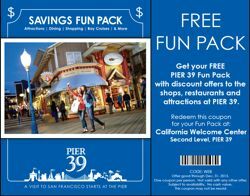 To qualify, either bring your AAA card if you're a member, or go to pier39.com and download and print out the Fun Pack coupon before you go. Tip for locals: Pier 39 has special discounts for Bay Area residents. Check their website for the Pier 39 coupons. Aquarium of the Bay discount. If you have kids under 12, you can get $2 off adult tickets and $1 off kids tickets to the Aquarium if you eat at any of the following restaurants and bring a kids menu with you to the Aquarium: Pier Market Seafood, Fog Harbor Fish House, or Wipeout Bar & Grill. Wipeout Bar & Grill discount. Have a coffee at the Biscoff Coffee Corner and take your receipt to the Wipeout Grill for a 20% discount on your meal. Free maps with coupons. The Fisherman's Wharf Map and San Francisco Map available in the Visitor's Center at Pier 39 have lots of coupons for the nearby attractions. They're useful maps, too, with attractions, hotels and other places of interest marked on them. Practical Tip: the Visitors Center provides some other useful services as well. They have luggage storage, $5 for a small bag and $10 for a suitcase, so you can avoid dragging heavy bags around while you explore. They also have free wifi, sell discount event tickets, and rent strollers and wheelchairs. Pier 39 is located at the far right end of Fisherman's Wharf on the Embarcadero, which turns into Jefferson Street, the main street of Fisherman's Wharf. Cable Cars: The two cable car lines leaving from Powell and Market will bring you within a couple of blocks of Pier 39. The F-Line Trolley: The antique street cars of the F-Line also stop at Pier 39. The F-line runs all the way down Market Street, and then all along the Embarcadero to Fisherman's Wharf. And of course, there's always Lyft and Uber. Download their apps to see the cars available nearby. Note: San Francisco is having a serious problem with car break-ins. Please don't leave anything visible (or valuable) in your car when you park. If you are driving, know that parking in this area is gruesome. I have been lucky on occasion with street parking, but the meters run 24 hours a day, even on Sundays and holidays (unique to this part of town) and they are only good for a half hour or an hour. The parking garages are very expensive, but there are ways around paying an arm and a leg to get rid of your car. If you're making a quick stop, an hour or less, one solution is the Pier 39 parking garage, because of coupons and restaurant validations. I'd recommend this if you're just running in to grab a quick bite. However, if you overstay just a little, you'll be paying for the next hour at $10-12 per hour. 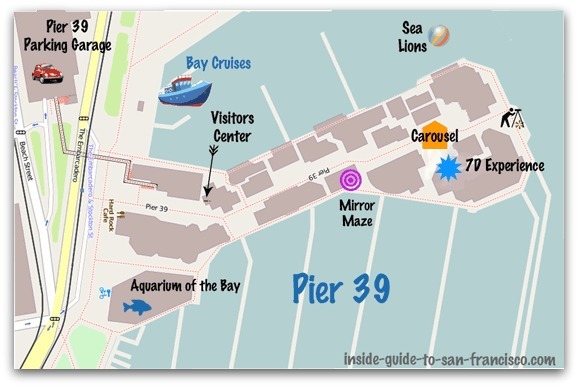 This is the most convenient garage for Pier 39, but not really worth it for most visits. 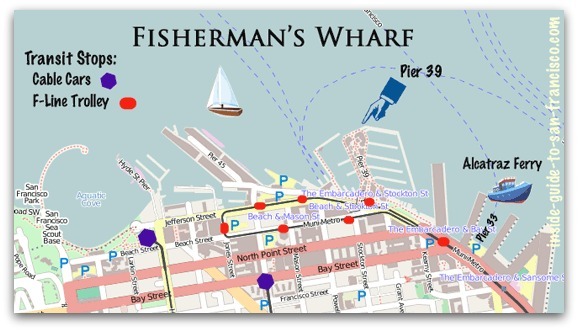 The best way is to book a space in one of the other Fisherman's Wharf garages using the Spot Hero parking app. I can usually find an all-day spot for $10, $12 at the most. You know you've got a spot and don't have to hunt for a garage in heavy traffic. See Spot Hero for available spaces. This is a large garage just across the street from Pier 39; very convenient, but pricey at $10 per hour weekdays (max $50) and $12 per hour weekends and holidays (max $60). 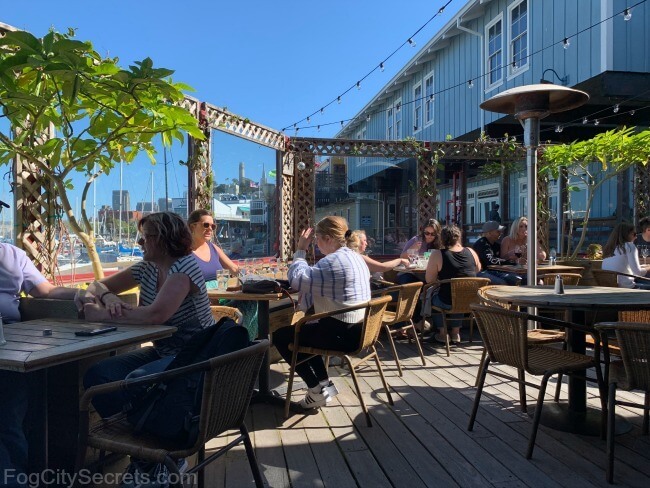 Get a free hour with a validation stamp if you eat at one of the full-serve restaurants at Pier 39 (listed on the back of the parking ticket). Or get your parking ticket stamped at the California Visitors Center at Pier 39, for one hour of free parking, as part of the Fun Pack described above. There are also numerous parking lots and garages in the general area of Pier 39, outside of Fisherman's Wharf, if you don't mind walking a few blocks. 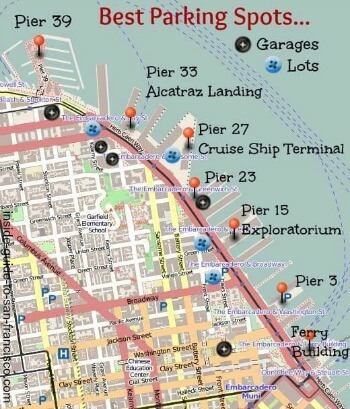 See my list and map of the best places to park along the Embarcadero. The easiest way: with these garages and lots as well, the best way to find a reasonably-priced space is to check out the prices and availability for the garages nearby and book a space ahead of time using parking apps like Spot Hero. I've been doing this more and more; this way you can usually get a good deal and don't have to worry about The Hunt. You can often get half-off the regular fee and a reserved space...very nice!